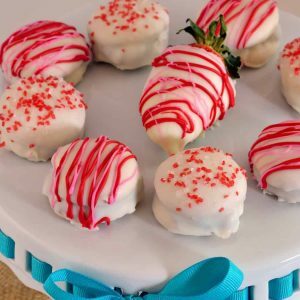 Strawberry Shortcake Cookies are a easy to make no-bake cookies that sandwich vanilla wafers with jam and are then dipped in white chocolate. Evenly spread strawberry jam on the top side of 12 Nilla wafers. Top with another Nilla wafer. Place in the freezer for at least 4 hours, but up to 24 hours. In a double boiler, or in the microwave, melt candy melts and shortening. Stir until smooth. Place one cookie on a fork and dip into white chocolate, covering on all sides and tapping to get excess chocolate off. Remove to a cooling rack with parchment or aluminum foil underneath to catch the drippings. Use excess chocolate to coat strawberries. If adding sprinkles, do so while chocolate is still warm. Otherwise, additional melted chocolate or frosting can be added after candy melts have set. Place into the refrigerator for 10 minutes to cool. Do not store in the refrigerator, but in an airtight container in a cool place.